For people of a certain age, it’s almost mind-blowing to think that Cracked is good now. Back when it was a magazine that was a knockoff of MAD, Dan Clowes‘ (a Cracked contributor in the ’80s) description was right: It was “comedy methadone“, for months when MAD wasn’t published. Never that great, but it seemed to fill the need. 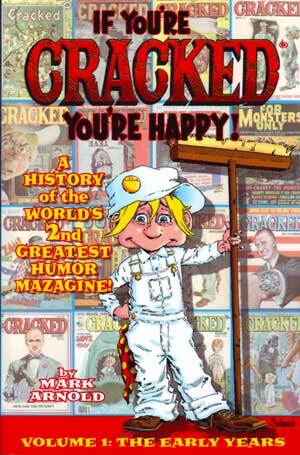 So, why of all things, would anyone read a book on the history of Cracked? Mark Arnold’s If You’re Cracked, You’re Happy is just that — and it’s surprisingly interesting. 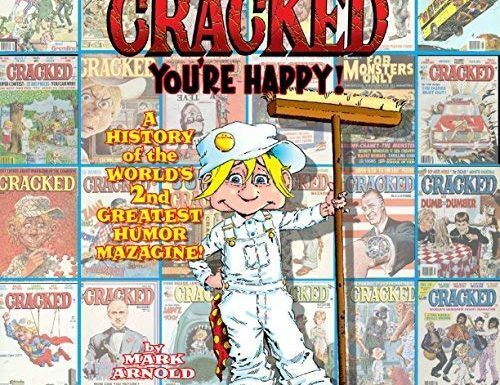 Arnold goes through the entire history of Cracked magazine, from its beginning in 1958 to its demise as a published entity in early 2007. While Cracked was an also-ran, it was the most successful of the MAD ripoff; a list of knockoffs that launched in 1958 alone is included in an early chapter — most lasted between one and six issues, and Cracked was the only one with a run of any real length. Yet, often, Cracked just wasn’t that funny — and Arnold goes into why. Once Laikin left, there were other editors, but while Cracked got better — it didn’t necessarily get GOOD. The editorial direction remained lax (though, of course, there at least WAS an editorial direction at that point, rather than “everything I write gets in”), where MAD had a very strong internal logic enforced by its editors. Artists and writers tended to like working for Cracked as work was usually published as-is, without many changes to the piece — but that way also made for a sloppier magazine, one that could vary wildly in tone and quality. Without someone there to help shepard pieces into being the best they could be, there wasn’t a particular Cracked feel. The heyday was in the ’80s under Mort Todd (and later MAD ex-pat Lou Silverstone and Andy Simmons, son of Matty from the National Lampoon); Todd brought in a lot of underground cartoonists, including Clowes and Peter Bagge — but unfortunately the publisher rejected Todd’s ideas to make Cracked a bit more like the Lampoon or even RAW and showcasing the underground cartoonists, making an edgier, more adult magazine. Unfortunately, this run didn’t last, and when Cracked was bought by the folks who ran the National Enquirer, they let the magazine wither on the vine. The most frustrating thing about the magazine is that there WAS quite a bit of talent there — particularly in the artists — but it just wasn’t sheparded in a way that brought everyone up. This is the really interesting thing about Arnold’s book; it’s a story of a magazine created for purely mercenary reasons (not that MAD is a charity) and how it kept flirting with being something more and getting knocked down by forces inside and outside. In a way, though, Arnold’s book is the same way; it was pitched to the owners of Cracked as a 50th anniversary coffee table book, but they inexplicably never returned his calls or messages, so he ended up doing it himself. As such, the artwork examples and illustrations are all tiny, unreadable scans, 4 up on a 7″x9″ page. The book’s editing isn’t great, either (one interviewee refers to “no bless oblige”) — and it’s quite expensive. It’s two soft-cover volumes, each costing about $30. Part of the reason why the books are so expensive is that it includes a complete Cracked checklist of every issue and article/reprint — which is nice to have, but it’s in the same large text as the rest of the book, making two 550 page volumes out of a book with about 300 pages of actual text/illustrations, and 800 of checklist. It’s defintely meticulously researched — but I wish it were handled a bit better to knock the price of the books down. Perhaps instead of splitting the story of Cracked across the two volumes, maybe make one volume the main text and the second the checklist? Perhaps then, too, the volume of main-text could afford to have more pages devoted to full-page artwork? The huge price-tag keeps me from highly recommending If You’re Cracked You’re Happy, but it’d definitely be worth checking out at the library. Or just keep reading Cracked.Com, either way.